Thousands of immigrant children were brought into the country by their parents and now face deportation from the only home they remember. For thousands, DACA (Deferred Action for Childhood Arrivals) provided a way to finish schooling and/or work legally without fear of deportation for two years. Now, changes to immigration policies means DACA is ending and all the DACA recipients, called Dreamers, are facing more questions than answers. Well, there’s no need to wade through the confusion alone. At the Law Office of Diron Rutty, LLC, our team specializes in immigration law. Start by getting answers to the most common questions below then contact us for help with your specific immigration questions and concerns. How are current DACA holders affected? The good news is, even though DACA is ending, it isn’t being stopped all at once; it’s being phased out over time. This means that if you are currently receiving DACA benefits, the employment authorization documents and other benefits will continue to be honored until they expire according to your specific agreement. The caveat is that your DACA benefits can be terminated or revoked according to previously mentioned reasons. What happens if I filed an application or requested an extension? If you filed a new request or an extension before September 5, 2017, your request will be reviewed on a case-by-case basis. If your current benefits expire between September 5, 2017 and March 5, 2018, the US Immigration and Customs Enforcement department will review requests submitted by October 5, 2017. Anything requests after will not be reviewed, so you will need to apply for other immigrant programs as appropriate. What happens when my DACA expires? When an individual’s period of deferred action ends, they will no longer be eligible for lawful employment or deferred action in regard to potential deportation. Individuals will need to apply for another visa or citizenship program to lawfully remain in the country. Will my information be given to ICE after my DACA expires? In broad and general terms, no. DACA recipient information will not be provided to US Immigration and Customs Enforcement (ICE) or Customs and Border Protection (CBP). However, if an individual meets the criteria for a Notice to Appear, they are a national security risk, or they pose a threat to public safety, that individual’s information may be forwarded to ICE or CBP. Can I travel outside the US while my DACA is still valid? Yes, but only if you have a previously-approved advance parole application (form I-131). According to the Department of Homeland Security website, any applications submitted after September 5, 2017 will not be accepted and currently submitted but not approved applications will be refunded and closed. DACA being phased out is going to affect thousands of people living in America in the coming months and years. If you’re unsure what this means for you, get knowledgeable help navigating the muddy waters. 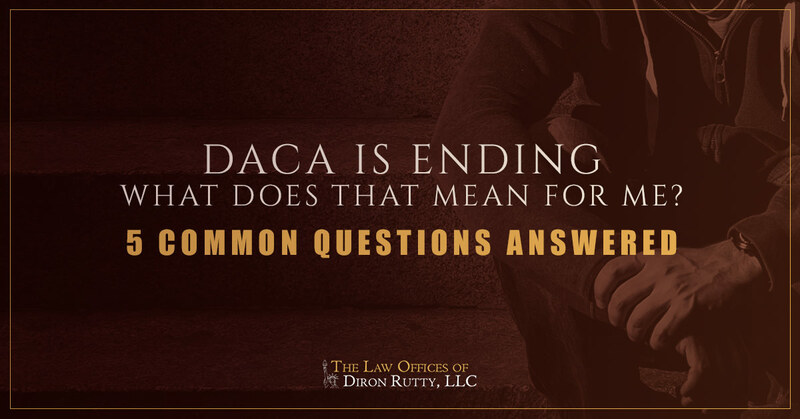 Contact the Law Office of Diron Rutty, LLC in the Bronx, Manhattan, or Poughkeepsie to meet with an immigration lawyer and discuss what your options are before your deferred action ends.